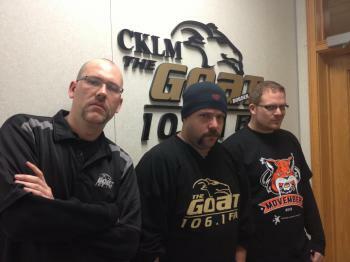 Vista Radio’s herd in Lloydminster is freshly shorn after a record-setting month of Movember. Listener participation, radio auctions, T-shirt sales, a fundraising concert, and a Mocial (The Goat’s wrap-up social) raised over $15,000 for Movember Canada, nearly double last year’s total of $8,000. “Community support this year took us well over the top. With over $10,000 donated from Movember participants from Husky Energy, the partnership with the Lloydminster Junior A Bobcats, organizers of the Stache Bash concert and the support from the Canadian Brewhouse, it was just a matter of HOW MUCH we were going to beat last year’s totals by,” said Assistant Program Director Devon Zelmer, who was The Goat’s Movember Team Leader. All the money raised will be used to help find a cure for prostate cancer and fund male mental health initiatives.